The opening two days of the Seamaster 2018 ITTF World Tour Platinum Qatar Open in Doha produced plenty of dramatic moments and surprising results for table tennis enthusiasts to sink their teeth into and day three was no exception as the player line-up for the two singles finals was decided on Saturday 10th March. 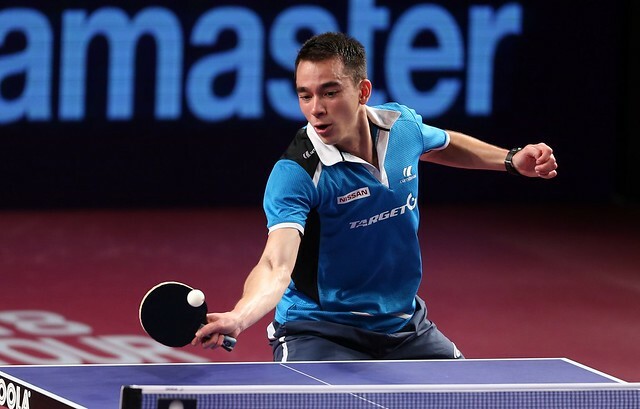 Chen Meng and Wang Manyu went head-to-head at the first ITTF World Tour event of the year held in the Hungarian capital of Budapest; the latter player proved victorious on that occasion and when the two Chinese competitors met at the penultimate stage of the Women’s Singles draw in Doha it was the same outcome. Last year at the Ali Bin Hamad Al Attiyah Arena this fixture was played out one stage later with Chen Meng coming out on top in the final, but in 2018 the fortunes were reversed as Wang Manyu produced a stunning performance (11-8, 11-6, 9-11, 11-6, 11-7) to progress beyond the last four. Contesting the semi-finals tie in the lower half of the draw were Liu Shiwen and Kasumi Ishikawa, who booked their spots in the penultimate round by eliminating Japanese opposition: qualifier Liu Shiwen recovered from a game down to beat Hitomi Sato across five games (10-12, 11-5, 11-2, 11-5, 11-5) while Kasumi Ishikawa negotiated a tight encounter with Miu Hirano (9-11, 14-12, 7-11, 11-9, 11-9, 14-12). Required to compete in the two-day qualification tournament for the Seamaster 2018 Qatar Open, but on the evening of Saturday 10th March China’s Liu Shiwen put in a fine display against Kasumi Ishikawa (11-5, 7-11, 11-8, 11-8, 11-4) to seal her place in the Women’s Singles title contest. The Men’s Singles event hosted quarter-finals action in the afternoon session of day three with respective victories for Fan Zhendong and Xu Xin against Jonathan Groth (9-11, 11-6, 12-10, 11-3, 14-12) and Zhou Yu (11-5, 10-12, 11-5, 13-11, 6-11, 10-12, 11-8) setting up a mouth-watering all-China encounter in the top half of the draw. The top seeded player in the Women’s Singles competition may have exited at the semi-finals stage but that was not the case over in the Men’s Singles category as Fan Zhendong extended his campaign in Doha; rising to the occasion, Fan Zhendong saw off pen-hold specialist Xu Xin by a four games to one scoreline (11-8, 7-11, 11-8, 11-9, 11-9) to keep his title aspirations alive. Standing out above the rest on the second day of the Seamaster 2018 Qatar Open, Hugo Calderano produced an even finer outing on day three of the tournament after the Brazilian representative defied the odds to secure a spot in the Men’s Singles final. 13th seed Hugo Calderano got his day off to a great start with a terrific victory over Japan’s Tomokazu Harimoto (11-5, 11-6, 11-5, 11-7) prior to a sensational performance in the last four where the Brazilian eliminated third seed Lin Gaoyuan in straight games (11-9, 11-8, 11-3, 11-6) to bring the day to a dramatic conclusion.